Things are 'swell' on the Oceanlady. Today's report from Mathieu Ferron (FRA) says sea swell has required them to moderate their heading further to the East for a few hours. But the forecast is for the sea conditions to ease over the coming hours, which will allow the crew to put more North in their heading, back on the direct route. "Everything is in good shape," he writes... Less than 2500 nautical miles to go. 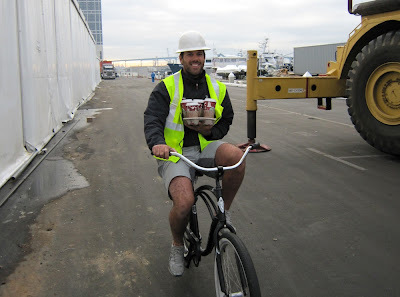 Design team co-ordinator Ian 'Fresh' Burns spent the Christmas holidays doing, what else, sailing. He co-navigated Wild Oats XI to a second place finish in the Sydney-Hobart race. Although Wild Oats made a late charge, they couldn't catch Alfa Romeo, where BMW ORACLE Racing trimmer Noel 'Nitro' Drennan (IRL) was among the international crew who raced to a line honours victory. 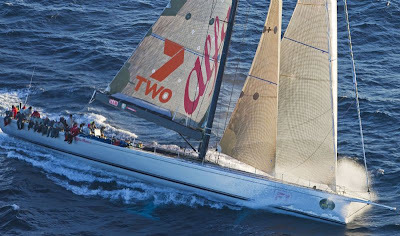 It was a big win for Nitro as it came during his 25th Sydney-Hobart. "Winning is definitely the nicest way to do it," he told team PR director Jane Eagleson (USA) afterwards. "And Fresh was on Wild Oats, so it was nice to beat him!!" Drennan's first participation in the race came back in 1980, on a boat called Challenge, owned by Lou Abrahams. "We had a pretty good race that year (3rd) and Lou has now done the race 45 times, so that was nice start for me." Perhaps that's where Nitro got his inspiration to reach the quarter century mark. Or maybe he just has a surplus of motivation - because no sooner had they crossed the finish line, than he was on a plane within a few hours to get to Melbourne to get racing in the A-Class championships. Arriving at the yacht club by noon the next day, he posted a very respectable 10th and 18th out of 50 boats that same afternoon. "I even beat JK (John Kostecki) and Cheese (Dirk de Ridder), so that was fun. We had four or five days of training before Christmas with Glenn (Ashby) and that was very productive." Design director Mike Drummond (NZL) and BOR 90 helmsman Jimmy Spithill (AUS) are also racing in the A-Class championships. But Spithill broke his mainsheet traveller in the first race and couldn't post a result on the first day. 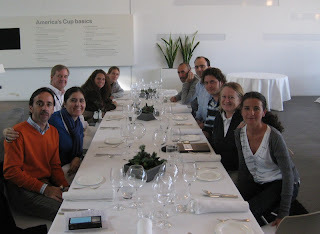 The VLC component of the team is growing daily as we gear up for the 33rd America's Cup Match. Below is a view from the balcony of the team base just after lunch, looking towards what was the media centre for the 32nd AC. In the foreground are some of the RIBs used by the weather team. Speaking of weather - it may be fairly overcast, but it's a gloriously warm day. Here's the BBC weather forecast for the VLC street circuit, the F1 track which winds it way along the front of the team bases during the Grand Prix. While most on the team have had a chance to re-connect with family and friends over the holiday, that's not the case for two of our guys on board the Oceanlady. Mathieu Feron (FRA) and Michel Mengardon (FRA) are the two members of the shore crew who have elected to accompany our precious cargo as it makes its way by sea from San Diego to Valencia. But that's not to say they didn't celebrate Christmas. Matt has sent in this picture of Christmas dinner - roast pig, cooked on a home-made BBQ. And you can see the Christmas tree in the background. No doubt some of our Kiwi team members can appreciate the BBQ element of the celebration! 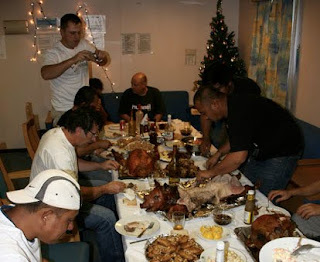 The crew of many nationalities shared the common bond of family, and all toasted absent family and friends over dinner. Meanwhile, the Oceanlady continues to steam towards Valencia at speeds near 18 knots, with the America's Cup Match just a shade over six weeks away. Best wishes from our team to all of our families, friends and supporters over the holiday season. Your support has been invaluable. It goes without saying that we have a big couple of months ahead of us and we look forward to sharing them with you. Our apologies, as there's a bit of a lag between picture-taking and posting, but this is how it looked from the bridge of the Oceanlady approaching Panama Bay and the Canal yesterday. Matt Feron sent the image and a note saying they've run 2913 nautical miles to date - that's nearly 40 percent of the total trip now in their wake. Time flies when you have 22 000 horsepower pushing you along! The Oceanlady has entered the Panama Canal. 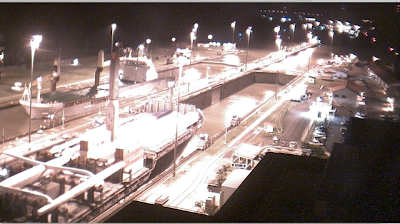 Here she is at the Miraflores lock, at 0120 GMT, on Wednesday morning. Thanks to Tom Ehman for the photo which he grabbed from one of the Panama Canal webcams. You can find them here. Sailing team coach and multiple time A-Class world champion Glenn Ashby (AUS) has invited some of the BMW ORACLE Racing sailing team down to Australia over the holidays for some multihull racing. The idea, according to Ashby, is for the guys, "to get as much racing in as possible over the next two weeks. They'll compete against each other and then the rest of the top A-Class sailors in Australia and New Zealand in the Australian Championships, which begin just after Christmas." Spending the holidays down under are sailing team members Jimmy Spithill (AUS), John Kostecki (USA), Dirk 'Cheese' de Ridder (NED), Noel Drennan (IRL) and coach Ashby. "They will need to trim, steer, make tactical decisions and do it all on their own, which will make for some good fun and learning outside the box," Ashby said. "And all of this on boats and bodies of water that the guys are mostly unfamiliar with." The guys are training under Glenn's watchful eye out of the McCrae Yacht Club on the Mornington Peninsula, in Victoria, Australia. The Australian A-Class Championships will be held at Safety Beach Sailing Club a few kilometres to the east. There are some great shots available from team photographer Gilles Martin-Raget (FRA) on the main team website. Take a look and download your favourite shot. Here is one of mine. Here's an 'end of year' slide show compiled by our fantastic team photographer Gilles Martin-Raget (FRA). It's been quite a year, and 2010 promises to be even more intense! You can see more great videos of the team on our YouTube page. They keep coming. More from Germany, the home of our partner, BMW. More from the BMW Tech Workshop in Munich. 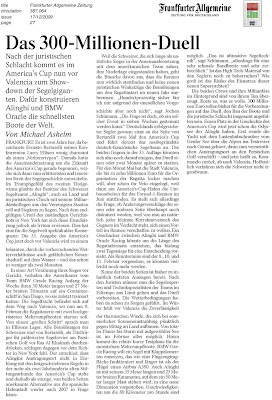 This one's for our German friends, from Saturday's Die Welt. 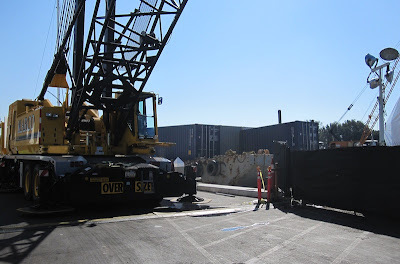 John von Seeburg and Rick Deppe have been on site in San Diego with the shore crew as they've loaded the Oceanlady and prepared to ship the team to Valencia. This afternoon, as soon as the ship left, Rick cut together this piece, which you can view on our YouTube channel. 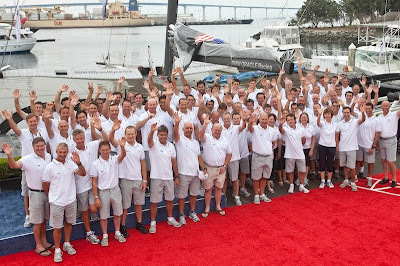 The crew from the monthly sailing show, CNN Mainsail, was in San Diego last month and the segment they shot will be on CNN International this week and repeated on the weekend. Unfortunately, this is NOT available on CNN in North America. The episode will be online here from the 22nd December. And she's off - bon voyage! The Oceanlady has left San Diego, as seen in this image from 'friend of the team' Troy Sears, who was out on the bay today. 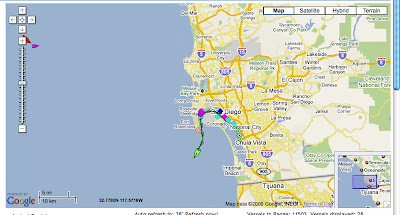 And here she is shown on the commercial ship tracking site, marinetraffic.com, at approx. 13:30 local time in San Diego, courtesy of Tom Ehman. BTW, you'll notice we've changed our reference to the ship Oceanlady, from Ocean Lady. All the official notices call her as Oceanlady, so we were clearly misinformed in our previous posts... We'll be using the correct name from now onwards. 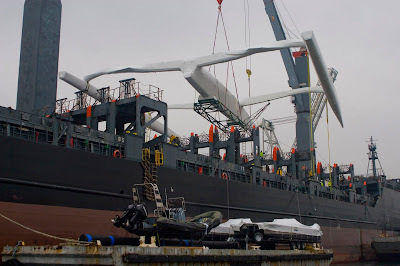 It's been a long night of hard work for the shore crew, but the beautiful wing sail for the BOR 90 is now aboard the Ocean Lady cargo ship, which will soon be bound for Valencia. 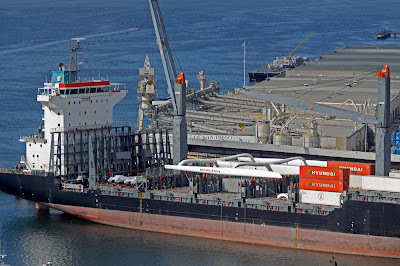 The wing was the final piece of the puzzle as far as loading goes, and the ship is expected to depart early Tuesday afternoon, local time in San Diego. Tim Kelley, the Vice President of R.E. 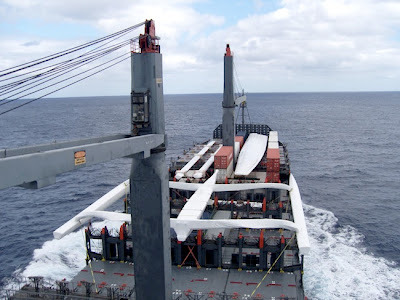 Staite Engineering Inc. who have worked with the team shore crew on the loading operation told our man John von that the wing is probably 'the most unusual item we've picked up'. 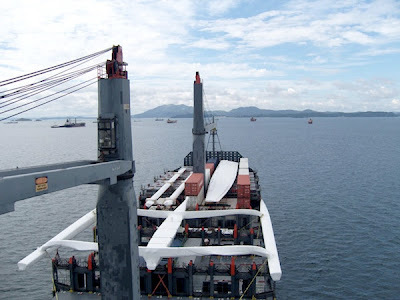 He said it's been a big challenge to handle the wing safely and required tight teamwork from the guys on the ship, the barge, the crane and the team shore crew. So today a hearty congratulations goes out to all involved - well done guys. Now go get some sleep! 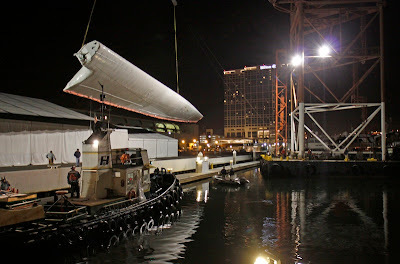 Loading of the Ocean Lady continues overnight in San Diego. 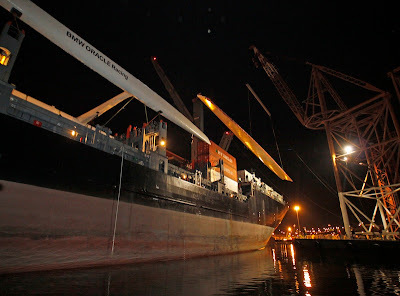 Our intrepid video producer John von Seeburg (USA) is putting in the long hours along with the shore crew and says that as of 04:30 local time in San Diego, the wing has been moved by floating crane to the ship and will be lifted on board shortly. He also spoke to design coordinator Ian 'Fresh' Burns (AUS) earlier in the night: "The ship is here, we've had a lot to put on it and we've been going step-by-step," getting everything in it's place. He also said it's "quite a step in the campaign to be going to Valencia. We're excited - after over a year here in San Diego, we're almost off now!" The loading work on the Ocean Lady continues Monday. 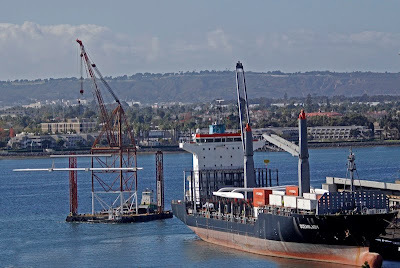 The sun has returned to San Diego and the masts are being loaded today. The wing is now back inside the big tent at the base in San Diego. Loading will resume on Monday, weather permitting. 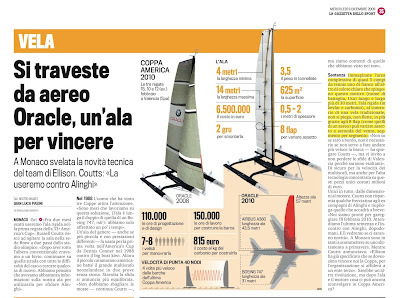 More nice press on the wing. For our friends in France. Reporter Michelle Slade gets tactician John Kostecki (USA) talking about sailing multihulls: "I hadn't done much before and it's fun because it's so different, the boat is so fast and challenging," he said. 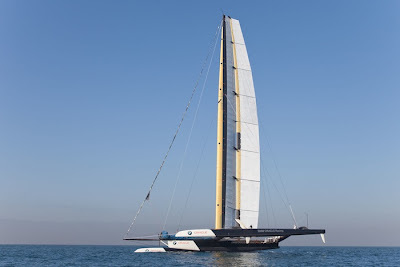 "I've sailed on eight or 10 different multi-hulls on this campaign in racing/training scenarios and I'm enjoying it. 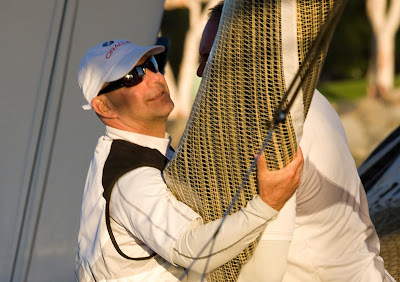 "Flying the hull is what the multi-hull game is all about, and what you're trying to achieve. The first few times flying the hull is pretty exciting, it gets your heart going. Eventually you get used to it and it becomes the norm because the boat's not performing at its optimum until you're flying the hull." 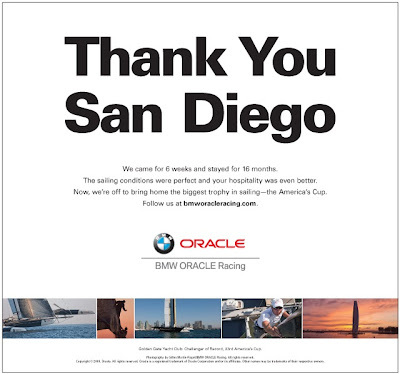 Friday was a bittersweet day in the BMW ORACLE Racing team campaign. Our time in San Diego is coming to a close, and during the afternoon, one hour ahead of schedule, the BOR 90 was moved from the team base to on board the cargo ship the Ocean Lady, which will transport it to Valencia. 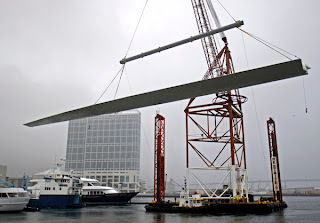 At 14:00 today, one hour ahead of schedule, the BOR 90 was lifted up into a grey, misty sky. She's now being loaded aboard the Ocean Lady for the journey to Valencia. Shannon Falcone (ANT) called it "one of the decisive moments" of the campaign. "San Diego has been great to the team so we're sorry to be going. But Valencia has been home to a lot of the guys, so at the same time we're looking forward to being 'home' again." 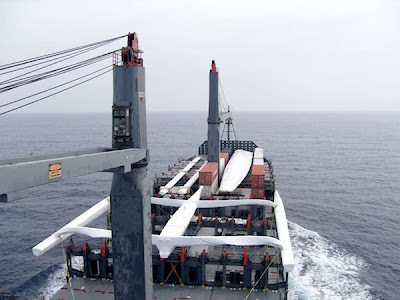 Julien Di Biase (SUI), who's been integral to the operation, said that loading the ship has been, "a smooth operation so far because we have highly skilled shore crew and sailors - the right people in the right jobs, starting with Scotty." Here of course, he's speaking of Scott Sandford (NZL), who has been directing the action on the day. John von reports that Scotty appears to be a three places at once, and in each of them, he's on the phone and radio simultaneously! Packing will continue on Saturday, weather permitting. 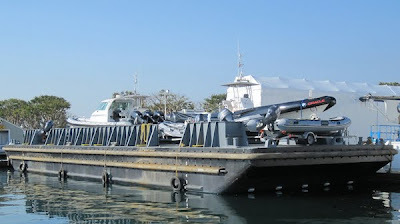 And finally, here's a story about the team on the Port of San Diego website. Thanks guys, we'll miss you. From San Diego, video producer John von Seeburg (USA) picked up his still camera on Thursday and sent us this shot of the BOR 90. 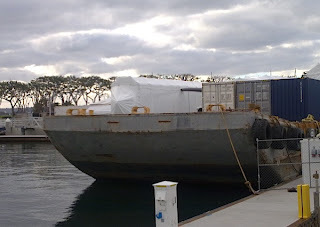 The temporary tent has been taken down, and the boat is being wrapped up for shipping. 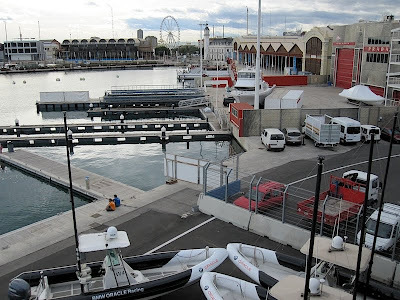 The Challenger for the 33rd America's Cup, Golden Gate Yacht Club and their team BMW ORACLE Racing, along with the Defender, Alinghi, met with government officials in Valencia on Thursday to kick-off plans for staging the event in the waters of Valencia in February. 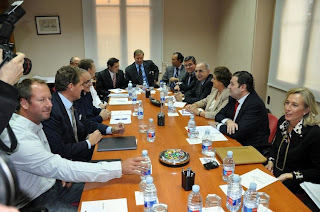 Representatives from the city, including Mayoress Rita Barberá, along with senior officials from the regional and national governments, were on hand to begin making plans for all aspects of hosting the event, which is scheduled to start on February 8, 2010. 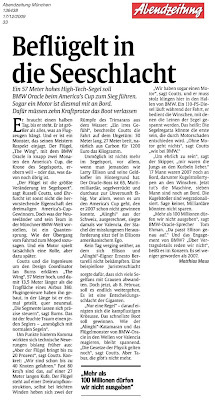 BMW ORACLE Racing was represented by Grant Davidson (NZL), Tom Ehman (USA), Joaquin Maldanado (ESP), Pablo Mataix (ESP) and Ruiz de Elvira (ESP). 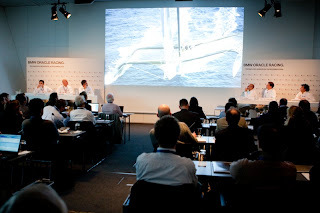 "With the America's Cup Match now less than two months away, we're happy that today, for the first time, the key parties were in the same room discussing what needs to be done to make this a successful event," said Tom Ehman, GGYC spokesman and head of external affairs for BMW ORACLE Racing. "The discussions were fruitful, we made real progress, and I am optimistic we are on the right track. The February date is fast approaching, but we all want the same thing -- to make this an event worthy of the America's Cup. We all agree that there is a lot of work to do in a very short time. But with Valencia's experience from the 2007 event and working together we can do it. "We agreed that a number of working parties will be immediately formed, with the relevant people from the Spanish authorities and each of the teams, to tackle the important tasks that need to be completed over the next eight weeks," Ehman said. The Fox 5 webcam is live from the team base in San Diego. The BOR 90 is in view as the team continues packing in preparation for shipping to Valencia in the coming days. Team CEO Russell Coutts (NZL) addressed delegates at the World Yacht Racing Forum in Monaco on Thursday afternoon, with Alinghi skipper Brad Butterworth following in turn. The two principals of the teams who will race in the 33rd America's Cup Match in February each spoke ahead of a larger group discussion about the future of Cup. On the heels of a magnificent slide show from team photographer Gilles Martin-Raget (FRA), Coutts opened by speaking about the BOR 90, the powerful trimaran his team has designed and built to race in the Match. Featuring for a sail the biggest wing ever built, Coutts called the boat a triumph of imagination, design and engineering. 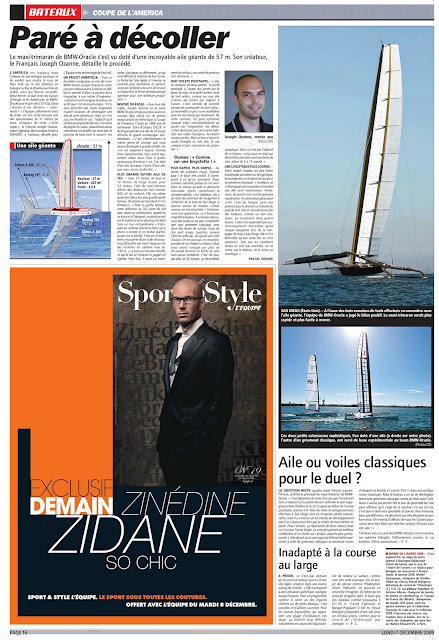 He also paid tribute to Alinghi's catamaran. 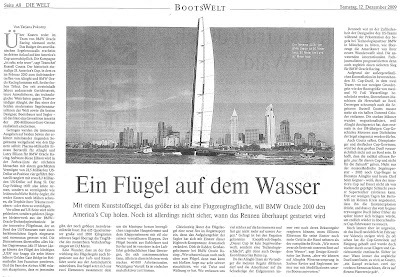 "I think in another 100 years, people might look back and see the BOR 90 and Alinghi 5 in the same way we now look at Reliance and Shamrock - as two of the most extreme Cup yachts of all time and landmarks in the Cup's rich history," he said. He went on to talk about the disputes that have plagued the Cup since July 2007, but paid a personal tribute to Butterworth, his previous tactician, saying: "Throughout these past two years, our team has tried not to personalise our differences. 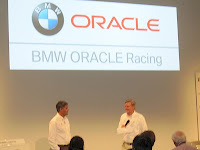 The fact that friendships have remained is a sign of how robust the links are between many of the people at BMW ORACLE and Alinghi. Thank you Brad, for still being Brad." Looking towards the future, Coutts said establishing neutral management for the event would be critical. In fact, he said, the next America's Cup must be guided by the principles of neutrality, fairness and mutual consent between the Defender and challengers. "The simplicity of the Deed is its beauty, particularly the words ‘mutual consent’," Coutts noted. "It works. 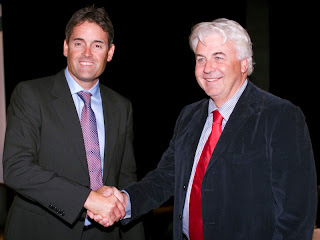 "The first step to a healthier future has to be truly independent management of the sporting issues. 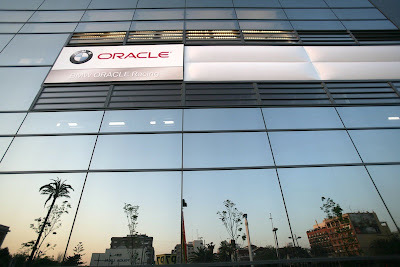 I believe this as does Larry Ellison, who has made a public pledge to have professional and independent management if BMW ORACLE is successful." This seemed to match up with what the majority of Cup teams want, if the group panel discussion which followed was anything to go by. A point repeated time and again was that the class of boat, for example, should be something the majority of the teams support. 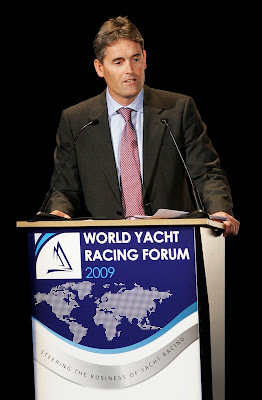 Coutts closed his talk by emphasising that much of what of the America's Cup community wants can be achieved under the terms of the existing Deed of Gift. "All it takes is a commitment to Mutual Consent. The two most beautiful words in the Deed of Gift." Some more feedback from the BMW technology workshop in Munich. This from Gian Luca Pasini and La Gazzetta Dello Sport. 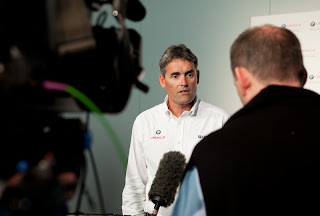 As well as a couple of more images from the conference that have come in from BMW. Team CEO Russell Coutts is now in Monaco for the World Yacht Racing Forum, and we'll have a report from there later this week. 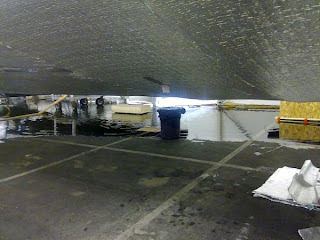 [We've had this come in from the San Diego branch, where heavy rains have challenged the pack-up crew... Thanks to Stephen Barclay (NZL) for the report]. We arrived at the base this morning (Tuesday) to pools of water after receiving over four inches of rain to start the week. VERY un-San Diego!! But despite the weather, the pack-up continues. The number of team members in town is dropping as designers and sailors leave for a well-earned break. As usual, the boat-builders and shore team will be the last to leave and the first to return. 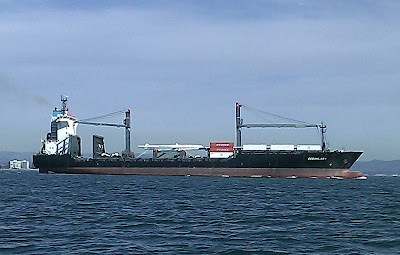 The BOR 90 is being prepared for shipping and is scheduled to depart San Diego next week, bound for Valencia. A big day for the team in Munich on Tuesday. As referenced earlier, BMW held a 'technology workshop' for the media with several members of the team at the BMW Welt in Munich. 50 media representing eight countries were present. Team CEO Russell Coutts (NZL) gave a talk entitled 'Dare to dream', speaking about what happens when talented designers are given the freedom to 'play in the sandbox' in the open design space of a Deed of Gift challenge. And design coordinator Ian 'Fresh' Burns (AUS) gave his insight into the risk vs. reward balance the team is attempting to strike as the Match draws near. The assembled media also enjoyed presentations from Joseph Ozanne (FRA) the leader of the wing project, who you've seen on the blog and YouTube before, Thomas Hahn (GER) and Christoph Erbelding (GER), two structural and aeronautical engineers with the BMW Group who have worked with the AC design team since 2004, and Francesco Pozzi, an expert in hydraulic systems and winches who led the engine project. Tom Ehman (USA) did a sterling job as master of ceremonies. Standing out as a highlight on the day was a spectacular slide show put together by team photographer Gilles Martin-Raget (FRA), which documented the progress of the team over the course of 2009. We'll be sure to bring you that here on the blog later this week. And John von Seeburg and his team put together some impressive videos. Here's the one used to set the mood for the day. It didn't take long for word from Munich to filter out into the media world. Stuart Alexander, writing for The Independent newspaper in the UK filed this report, including an audio interview with Russell Coutts, within a few minutes of the close of play today. Of course, we have to acknowledge our friends at BMW who pulled the day together. And a big thanks was also extended by Russell and the other presenters, acknowledging how important the support of BMW has been to the team through what has been a very challenging AC campaign. It's great to have friends like that when you need them most. Our thanks to all involved. Yesterday we had snow in Nevada. 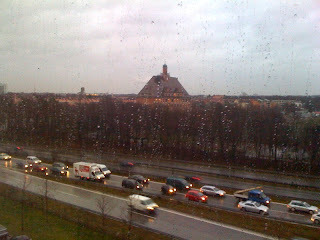 Today, it's rain in San Diego and Munich. 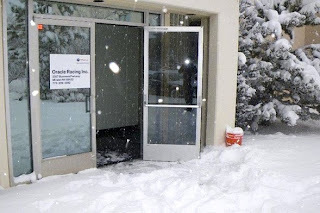 After going almost completely without rain for the past six months in San Diego, on Monday, the heavens opened, making for unpleasant working conditions for the team on pack-up duty. It must be time to leave. Similar weather in Munich, where the PR and media team is at BMW Welt, where BMW is hosting a technology workshop featuring team CEO Russell Coutts along with a handful of design team members. We'll have more from Munich, and the BMW technology workshop, later today. 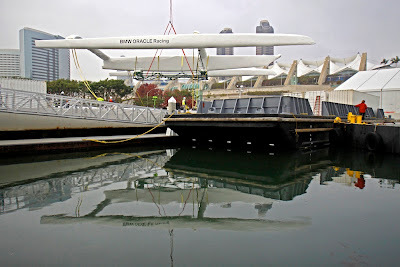 With the first race of the 33rd America's Cup Match scheduled for February 8th 2010 in Valencia, today marks just two months from the Match. Our team is going gangbusters in San Diego, Anacortes, Valencia, and points beyond, to be ready for racing in February. You already know our team operates out of Anacortes, USA (boatbuilders), San Diego, USA (training), Valencia, Spain (our old and soon to be new home) and at regattas around the world (Louis Vuitton Trophy, RC 44, MedCup etc). Well that's not the only places you'll find us. 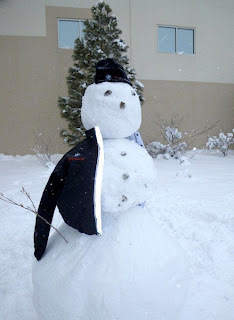 Here are a couple of photos from the Nevada branch, where Craig Phillips (AUS), head of our Minden, Nevada, sail-making team, sent in these winter snapshots, including a snowman kitted out in team gear. From Sunday's San Diego Union-Tribune newspaper, a note of thanks from the team. And with google translation into English. Here Tom Ehman (USA) - seated third from left - and Jane Eagleson (USA) - seated second from right - host the luncheon. It won't be much of a weekend for the San Diego pack-up crew as work continues unabated. There are 19 shipping containers to pack and plenty more besides...nearly 200 tonnes in total. 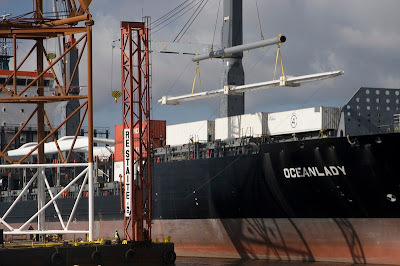 Nearly all of the cargo (containers, RIBs, etc) is first loaded on a barge, which will be pushed over to the cargo ship, where it will then get loaded on board. With the team packing up in San Diego for the move back to Valencia, things are starting to ramp up in Spain. 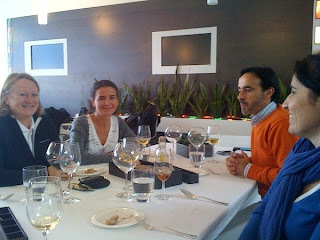 On Friday afternoon, Jane Eagleson (USA), our Director of PR and Media, hosted a lunch with the local media at the team base. 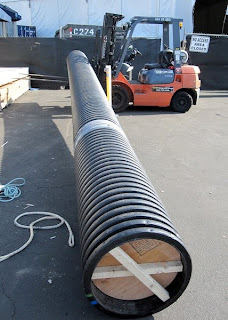 Life is going to get a little more difficult in San Diego for the team members still on site on the packing detail. 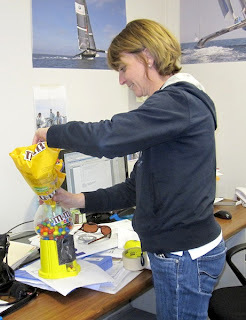 Cathy Ryan (FRA) is leaving on Friday and her M+M machine is going with her. (More on that later). 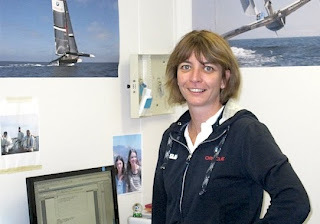 Cathy started with BMW ORACLE Racing in October 2007: "I never knew anything about the America's Cup at the time. But a friend was working for the team and told me they needed some help. So I started working part-time, just 10am to 3pm, a few days a week, looking after the team apartments." She laughs as she says this. 10 til 3 would constitute a very small fraction of her working day now. From that start in Valencia, beginning a few months after the end of the 32nd America's Cup, Cathy soon became an indispensable member of the admin team. Her official title is Sailing Team Administrator but in reality, she's the den mother to the entire team, looking after, well, everything. "Basically I try to look after everybody who needs help," she says. And that's about as good a job description as any. If you need help with something - travel, visa arrangements, laundry, organising thanksgiving dinner for 100, or birthday cakes, she's the one to turn to. She just gets it done. "The job is never the same, there's always something different. And here, with so many people away from their homes or their families, I feel like a counsellor as well at times.People come in here, telling me their stories." No doubt the counsel is welcome, but there's also the matter of the M+M machine that makes her office the gathering place for team members needing a sugar hit. "I love sweets and sweet things. I always have to snack," she says. "One day I bought M+Ms and everybody seemed to like them, so I kept buying them. Then a few of the sailors had been on a weekend in Las Vegas and they brought this little machine back for me. So now, it's a tradition. It's amazing. People have a hard day, they're tired or frustrated, they come here, they grab a handful of M+Ms and, like magic, they're smiling again." The M+M dispenser will soon be filled up in Valencia, where the team relocates at the end of the month. For Cathy, returning to her home in Spain can't come soon enough. She has her husband and two daughters there, and she's looking forward to seeing her first America's Cup. "I've never seen an America's Cup race. I wasn't involved with the team last time and I think I went down to the port with my family for a look just once or twice, so it will be great to finally see what this is all about."